My wife made a really tasty chicken dish the other day. 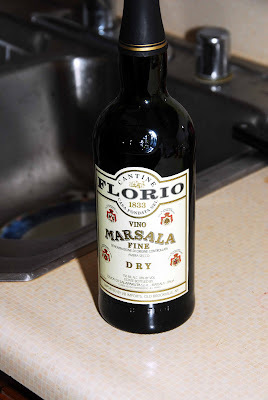 It has a sauce with marsala wine, which is always good, and is accompanied by mushrooms and prosciutto. How can you go wrong? This recipe comes from Frank Pelligrino’s new cookbook, Recipes from the Neighborhood. Lay a pounded chicken breast open flat. Place a slice of prosciutto, a slice of mozzarella, a heaping tablespoon of pecorino romano on one half and season with pepper. Fold the other half over. Pound the edges so they are thin. Heat olive oil in a skillet over medium heat. Dredge chicken breasts in flour and egg. Place in pan. Cook about 3 minutes on each side or until browned. Remove and set aside. Add the mushrooms to the pan. Season with salt and pepper. Cook until soft (10-15 minutes) and remove any liquid from the pan. Add the butter, wine and chicken broth. Bring to a boil. Return the chicken to the pan and reduce heat to a simmer. Cook 15 minutes. 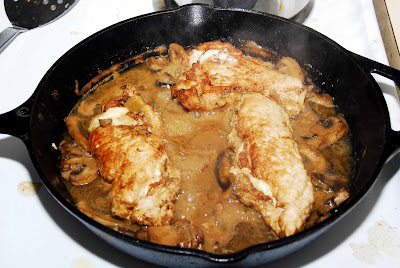 Pour mushroom sauce over the chicken to serve. This dish needs some accompaniment. Here is a tasty soup to go along. Brown bacon in stock pot and remove from pot. Cool and chop into bits. Sauté onion, garlic and carrots in bacon grease slowly. Add the potato, cabbage, parsley, basil and salt. Cook 45 minutes in 2 qt. Chicken broth. Add tomatoes, kidney beans and pasta. Cook until pasta is tender. 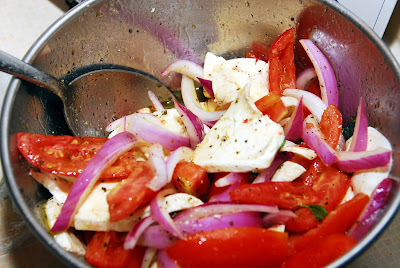 You should also think about a tomato, red onion and mozzarella salad. Another option is an appetizer plate. 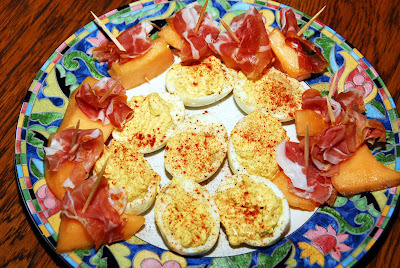 Here is one with a few deviled eggs and proscuitto with melon. 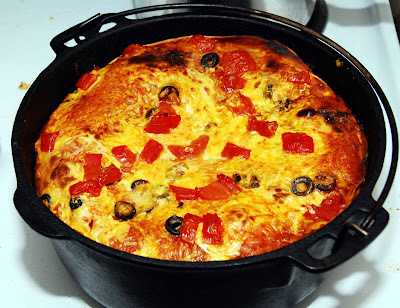 Last night we had Dutch oven enchiladas. I originally got the recipe on a camping trip from a friend named Trig. 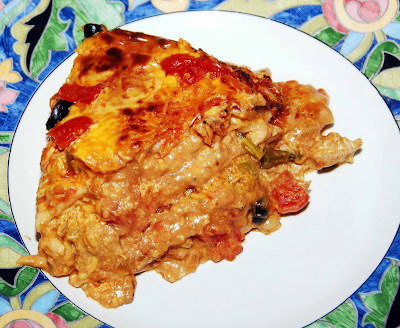 The original recipe and instructions can be found here. You don't necessarily have to go to the whole trouble of the coals etc. You can make these in the oven at 375 for an hour covered with a brief blast under the broiler to darken the top. Last night I modified the recipe by taking out the sour cream and instead using cream cheese. I got the idea when I was reading about a new trend in Mexican food. 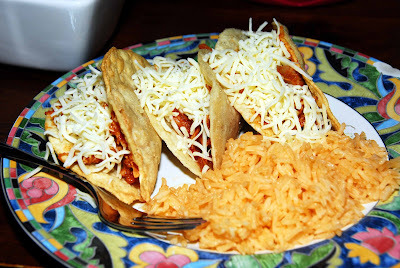 They have been using cream cheese in enchiladas and calling it enchiladas suisa - with the suisa meaning Swiss. The swiss are famous for dairy products hence the name. Since the apartment complex banned my smoker and grill I had to do these in the oven as described above. They were still great but these taste somehow amazingly better around a campfire. Just be sure that you don't get too frisky and cut the enchiladas before they've cooled a little. You want them to firm up a bit before serving - usually about 10 minutes cooling does it. In other news, I found a Bruce Springsteen album released a couple years ago where he does old folk songs. Its great! Check out The Seeger Sessions. A lot of stuff is happening really fast right now. I just found out that I passed the general surgery written boards - making me a diplomat of the American Board of Surgery. I have to take my oral boards in Baltimore at the end of September. We had one of my favorite meals to celebrate. 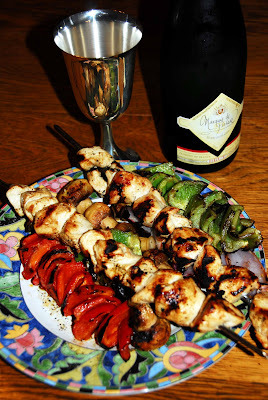 Chicken kabobs and the hot bulgur wheat dish that my naughty cousin from Sioux Falls makes. I just got word that there is an outrageously strong possibility I will be going to South Africa next may for some serious hunting. I'll try not to get eaten. I've already started my preparations. Probably the most important piece of equipment you have with you besides your brain and your rifle is your pair of boots. You want a very well broken in pair of boots that are of medium weight like a good sturdy hiking boot. Yesterday I looked in my closet and found that the only pair of boots I have besides my motorcycle boots is a pair of steel toed workboots that I use when I'm cutting firewood. They're much too heavy for walking miles and miles through the jungle chasing lions and whatnot. So I went to the Bass Pro Shop and hunted for a new pair of boots. I found the perfect pair - Vasque Sundowners! I used to have a pair of those when I was in college and I loved them. They'll go anywhere and do anything. I was trying to sneak the purchase by the wife but the baby busted me. As soon as I walked out wearing the new boots she pointed at my feet and said "Daddy's boots!" I got two other items. The first is a book on the History of South Africa. I figured it would be good to know a little bit about the country. The other book I bought you'll laugh at but hear me out. I bought the book Teach Yourself Zulu. Why did I get that book? It is the most commonly spoken language in South Africa. The second most common is Afrikaans. Most of the people who speak Afrikaans can speak English so I got that one covered. The people who speak Zulu are likely to be the trackers, skinners, porters etc. Wouldn't you want to know what they are saying without relying on a translator, who may or may not feel like telling you the truth? Anyway it will make it more fun. More news as this develops. 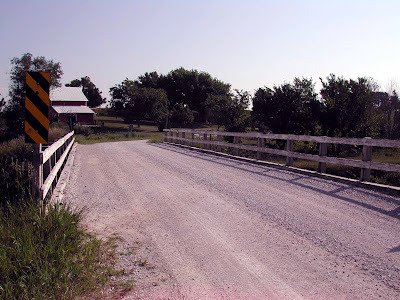 I got the news today that the bridge to my grandfathers old farm is set for rebuilding! It went into disrepair sometime last winter. The county was planning on letting it stay that way but they have finally decided to rebuild. 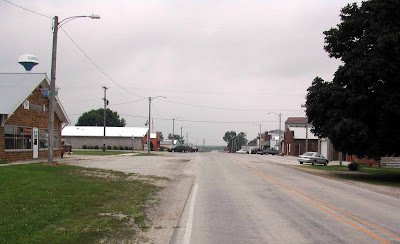 It is north of Livermore Iowa. Last Thursday 8/16 was the 30th death anniversary of Elvis Presley. Of course being down south here it is a huge deal. I heard all about it last week. 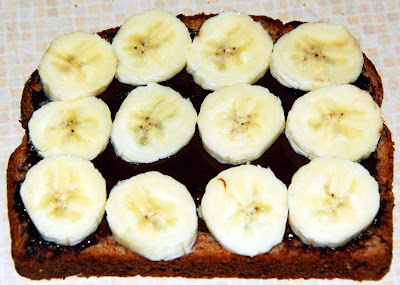 That got me thinking of a treat that my mom used to make me all the time - peanut butter and banana sandwiches. At must have eaten hundreds of the things when I was growing up. They were sometimes on plain bread, sometimes on toasted bread and other times they were grilled like a grilled cheese. It wasn't until I was pigging out on a plateful of them in the Burge Hall cafeteria in college that I learned that Elvis also loved them. I used to grab a banana from the salad bar and some peanut butter and bread and go to town. They were especially nice on days when I was getting beat up by organic chemistry or some other nightmare class. 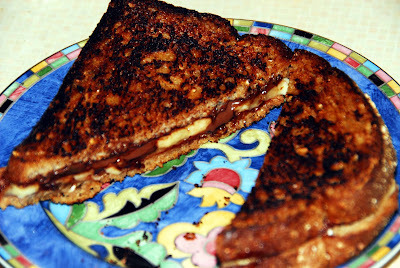 Lately I have been making them with Nutella - a hazelnut and chocolate spread that is similar to peanut butter. 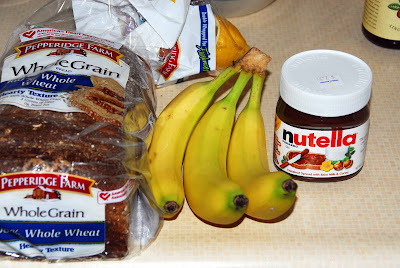 To make one just smear a little Nutella on a piece of bread and add sliced banana. 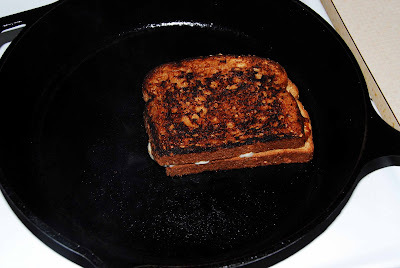 Top with another slice of bread, butter both pieces and grill in a frying pan. When its done cut it on the diagonal or Easy E will have a meltdown! I got a call from our man in the field last night with an exciting update. The American Legion in Ledyard had its annual chicken feed. Every year they have this great feed featuring grilled chicken. This year was the 41st year and it was a smashing success. At 7:30PM the was still a line that stretched for most of the length of the town. Of course our man in the field got his chicken early enough to beat the crowds. In other news, there was recently an oat fest and pictures are forthcoming. 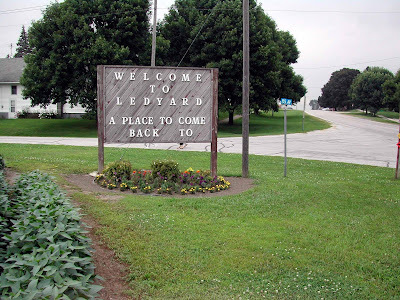 Now for a little tour of Ledyard. The highest structure in town is the elevator. 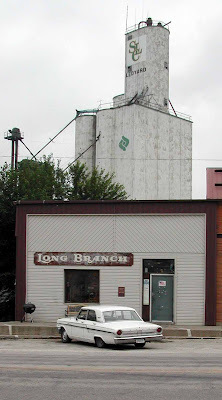 I think it is part of a network of elevators called the State Line Cooperative. The downtown is fairly bustling during business hours. Also shown in the photo is the water tower, which effortlessly provides citizens with an uninterrupted flow of potable water. 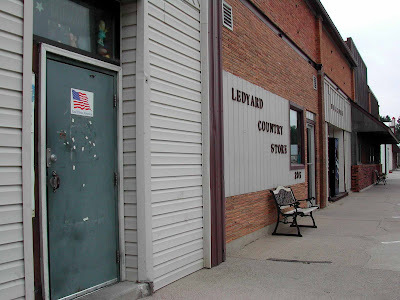 Ledyard has an excellent country store. 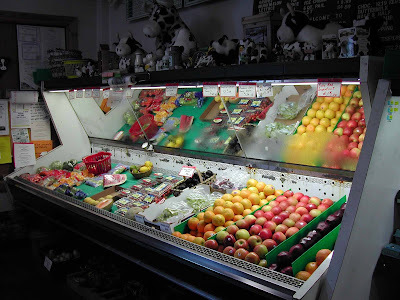 They have a fine selection of fresh produce. 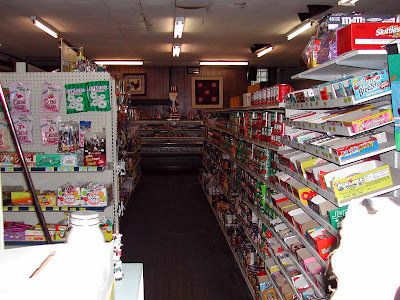 And a large stock of the finest quality non-perishables. 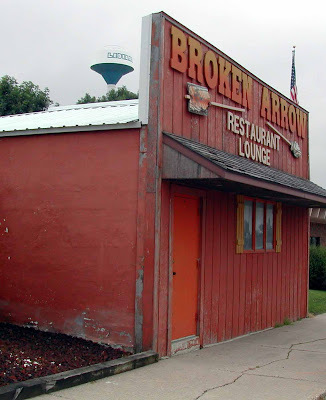 There was also a local public house called the broken arrow. It has since stopped functioning as a restaurant but is instead serving as a repository for treasures. I personally think the town undersells itself. 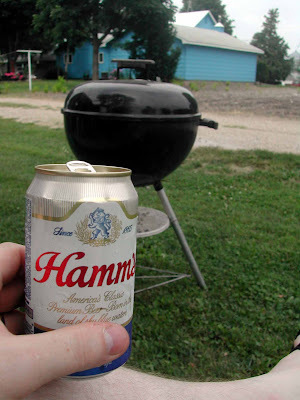 Where else can you sit in the yard and bar-b-que and drink beer in the middle of the day without anyone batting an eye? 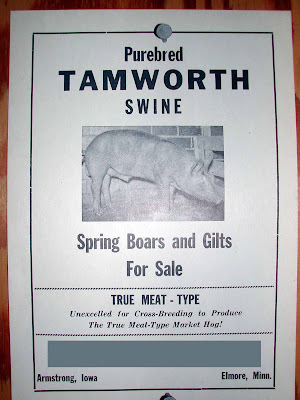 Also, at one time, Ledyard was a supplier of the best breed of swine known to man - the Tamworth! 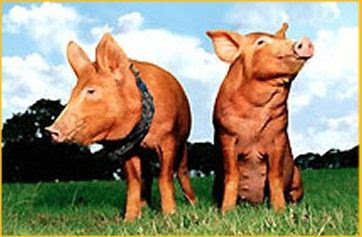 For those of you who don't know, the Tamworth is a variety of pigs that are colored red. I think they look much tastier with the red color. 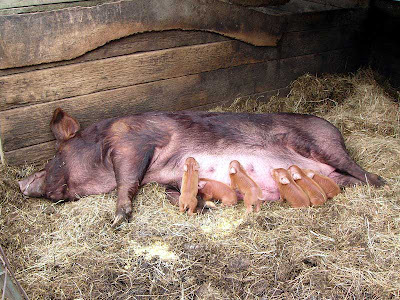 The Tamworth is one of the oldest breeds of pig, thought to be descended from wild boars. This breed exhibits an elongated head shape and a long narrow body. 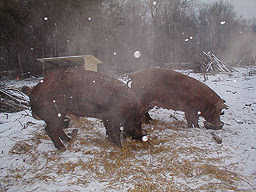 Tamworths are considered a medium sized porcine breed, with a full grown boar ranging from 250 to 370 kilograms and the mature sow from 200 to 300 kilograms. The adult length ranges from 1.0 to 1.4 metres and heights of about 50 to 65 centimetres are common. The most salient feature of the Tamworth is its great hardiness with respect to adverse climates. Thus the breed does well in its more northerly settings such as Scotland and Canada, where winters are severe, not only in regard to cold but also high winds. The animal is not only durable and rugged, but is extremely well suited for forest grazing. The Tamworth graze compatibly with cattle, being able to retrieve forage that cattle leave behind in the open pasture. The Tamworth displays a good disposition and enjoys the attention of humans. 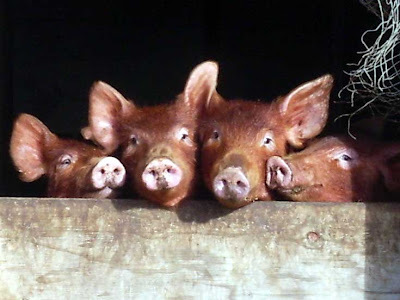 The Tamworth is considered the best bacon hog in the United States and boasts one of the leanest carcasses of all the pork breeds, perfect if you are watching your cholesterol but can't live without pork! The ham is muscular and firm although it lacks the size and bulk found in most other breeds. Originating in England, the breed name derives from the town of Tamworth in Staffordshire. Sir Robert Peel of Tamworth brought in some stock from Ireland called Irish Grazers in the year 1809 to begin cross-breeding with his Tamworth stock. This herd, further improved and altered in the English Midlands during the early 19th century is thought to be the origin of Tamworths. 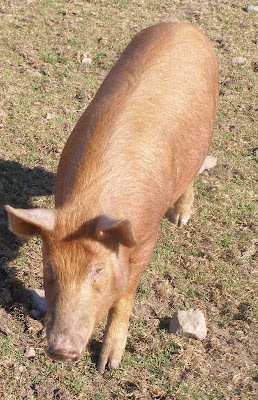 From the time of Sir Robert's efforts, the breed has been kept quite separate from others and thus is thought to be one of the purest swine breeds. 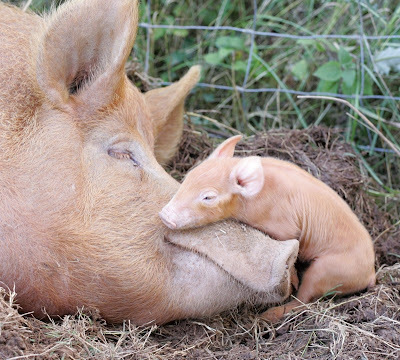 There are reportedly less than 1000 Tamworth hogs registered in the US. I have a thing with Cuban sandwiches. The first time I got one was in Key West. We were staying in Key Largo and drove down to Key West for the day. We rented a scooter and tooled around the island, exploring the back streets and alleys for a day. I wanted to stop for Cuban food, but the one promising restaurant was closed for the day. I noticed that a lot of laundromats had sandwich shops attached. Intrigued we stopped off at one and ordered Cuban sandwiches. The rest is history. 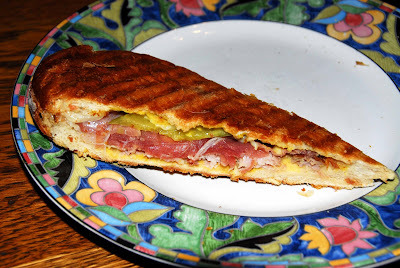 It turns out that the version of Cuban sandwich that we were served is particular to Key West. 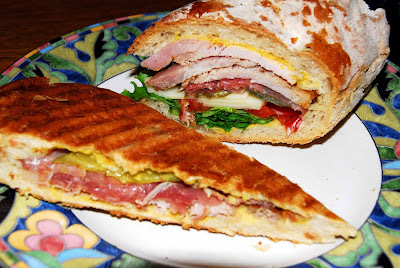 A traditional Cuban Sandwich is the Cuban version of a hot ham and cheese with ham and pork roast included. In key west they don't grill the sandwich and instead add lettuce and tomato. A real Cuban sandwich has yellow mustard, Cuban Roast Pork, ham, dill pickle slices and Swiss cheese. 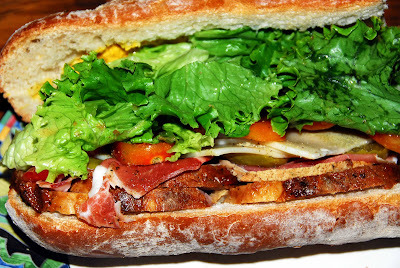 It is served on Cuban bread which is a lot like ciabatta bread. 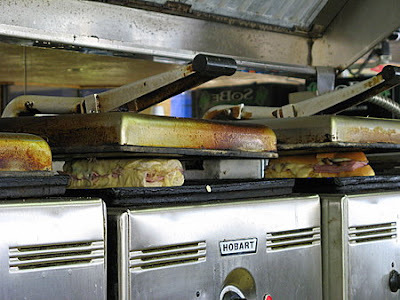 The sandwich is then pressed in a sandwich press. I have been making my own version at home using a panini maker I bought at Target for like $20. My naughty wife tried to sell it at our garage sale but I rescued it. I permanently disfigured it so that she will not attempt to sell it again. Here is a photo of one of my homemade badboys. I have been substituting proscuitto for the ham lately with great results. Easy E will no doubt notice that this sandwich has been cut on the extreme diagonal. He will no doubt be pleased, as E prefers his sandwiches cut that way. I also made a Key West style last night to have a head to head comparison. The only thing left to be decided is which one is better. Here they are, facing off on the plate. They were both very fierce competitors. Which one was better? I couldn't decide so I ate them both! 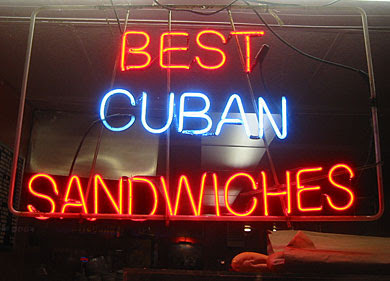 PS - if you go to a Cuban dance club be sure you don't get stuck in the other version of a Cuban sandwich. 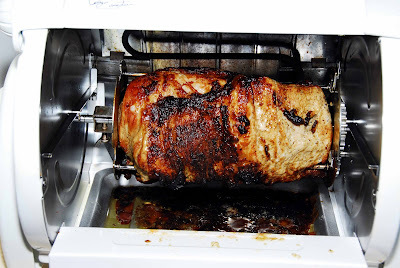 I made up some Cuban Pork Roast in the George Foreman Rotisserie. Kroger had pork loin on sale real cheap. My apartment complex banned my smoker. I guess I was using it too much and the aroma of slowly smoking beef and pork was too much for some people to handle. We don't mind, there are a lot of ways to skin a cat! I took half of the pork roast and made it into some taco meat. I recommend making it with corn tortillas that you fry in oil and then salt. Homemade taco shells really set the dish off. Chop the pork roast up into large chunks. Dump all of the ingredients in a Dutch oven, cover and bring to a boil. Reduce heat and simmer for 1 hour. At the end of the hour uncover pot and remove pork, leaving liquid behind to simmer and thicken up. 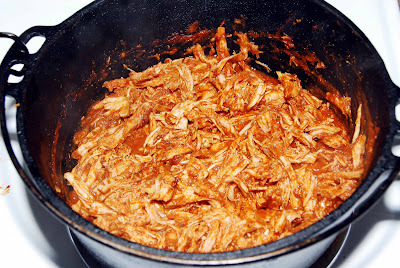 After the pork cools shred it up and return to the pot with the thickened liquid. The meat is best served in homemade taco shells. To make one just buy a bunch of corn tortillas. Heat some oil in a skillet and drop in the tortilla. After a little while flip the tortilla over and fold it in half. Continue to cook until it starts to crisp up. Remove the shells to a piece of newspaper and sprinkle with salt. 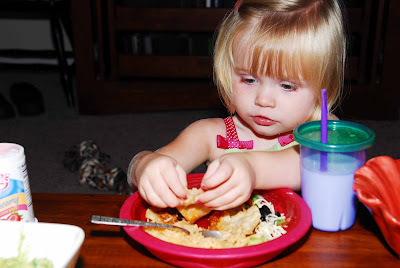 Even naughty toddlers like pork tacos! I was riding around this AM and came up behind a guy on a scooter. For some reason there have been a buttload of scooters zooming around Louisville lately. Most of the people riding them are in their late 40's to early 50's. Apparently they think that scooters aren't dangerous because none of them wear helmets and very few of them wear anything but shorts and flip-flops. I was getting annoyed because the guy was driving extremely slowly. Then I thought 'oh, he can't go any faster.' You see, scooters are so wimpy and underpowered that they can only go about 25-30 mph. The thought of a Triumph sneaking up behind a scooter made me think about the movie Quadrophenia. The movie was the acting debut of none other than Sting. It was about the early 1960's cultural phenomenon in England known as the Mods and Rockers. Here is an example of a rocker. 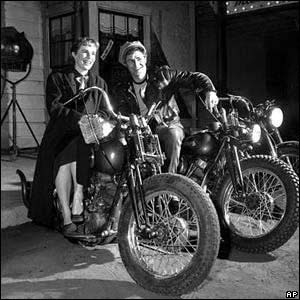 Rockers tended to ride motorcycles and wear leather. They were the 1950's equivalent of the modern day bikers. Rockers generally bought standard factory-made motorcycles and stripped them down, tuned them up and modified them to appear like racing bikes. 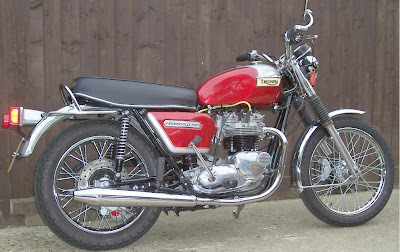 Here is an example of a stock bike that might be modified. 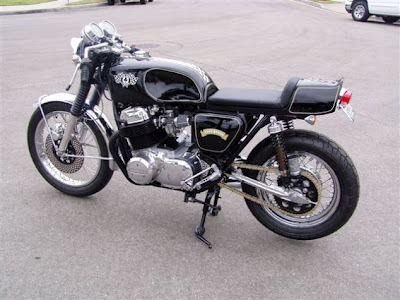 And here is an example of what it might have been modified into - a cafe racer. They raced them on public roads and travelled to cafes such as The Ace Cafe, Chelsea Bridge tea stall, Ace of Spades, Busy Bee and Johnsons. Largely due to their clothing styles and dirtiness, the rockers were not widely welcomed by venues such as pubs and dance halls. The first rockers were primarily known for their motorcycles, but by the 1960s, they became associated with a specific music genre and clothing style. Rockers mostly favoured 1950s and early-1960s rock and roll by artists such as Gene Vincent, Eddie Cochran, Chuck Berry and Elvis Presley. The mods, on the other hand, tended to be from upper class or upper middle class backgrounds. 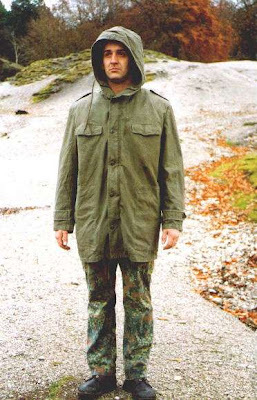 The first mods had parents in the fashion industry and thus had access to very nice clothing for the time. From these originals sprang the mod culture, sporting suits, nice shoes and short haircuts. Mods like dancing late at night. They would take amphetamines and other stimulants to be able to stay up all night. Rockers generally looked down on mods for that particular habit. As a consequence of being out very late at night, public transportation was not available. Cars were too expensive so the mods, being too wimpy and canary-like to ride a real motorcycle, bought scooters instead. Yes that is a real scooter that was ridden by a real mod. Seem a little ridiculous to you? All the mirrors were on there for two reasons. First, there was a law passed in Britain that all motorized vehicles had to have at least one mirror. To make fun of the law, mods loaded down their already underpowered and overweighted mopeds with a ton of mirrors. Cute. 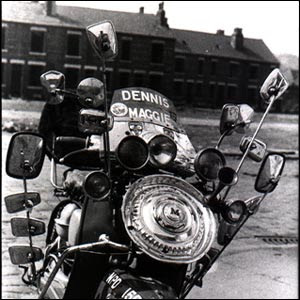 Second, and more importantly, mods were always starting fights and lipping off to rockers. As a result, the mods had to have something on their mopeds for the rockers to take as a trophy after they got their guts stomped out. Lambretta and Vespa scooters were preferred. 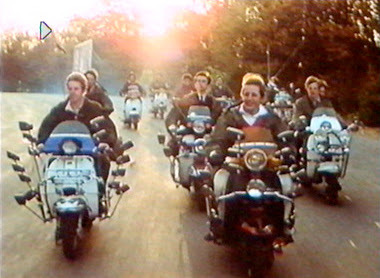 The mods vs. rockers conflicts were highlighted in the movie Quadrophenia. Rockers, wearing leather jackets and riding heavy motorcycles, poured scorn on the mods, who wore suits and rode scooters. The rockers considered mods to be weedy, effeminate snobs. Mods saw rockers as out of touch, oafish and grubby. Mods were usually city dwellers, whereas rockers tended to be more rural. Mods sometimes held down office jobs, whereas rockers were often manual workers (although there were many exceptions in both groups). Musically, there was not much common ground; with the rockers clinging to 1950s rock and roll, mostly by white American artists such as Elvis Presley, Gene Vincent and Eddie Cochran. Mods generally favored 1960s rhythm and blues, soul and ska by black American and Jamaican musicians, although many of them also liked British R&B/beat groups such as The Who, The Small Faces and The Yardbirds. Fights occurred where territories overlapped or rival factions happened upon each other. Mods sometimes sewed fish hooks into the backs of their lapels to shred the fingers of assailants. Weapons were often in evidence; coshes and flick knives being favored. The conflict came to a head on the south coast of England, where Londoners head for seaside resorts on Bank Holidays. In 1964, thousands of mods descended upon Margate, Broadstairs and Brighton to find that an inordinately large number of rockers had made the same holiday plans. Within a short time, marauding gangs of mods and rockers were openly fighting, often using pieces of deckchairs. The worst violence was at Brighton, where fights lasted two days and moved along the coast to Hastings and back; hence the Second Battle of Hastings tag. 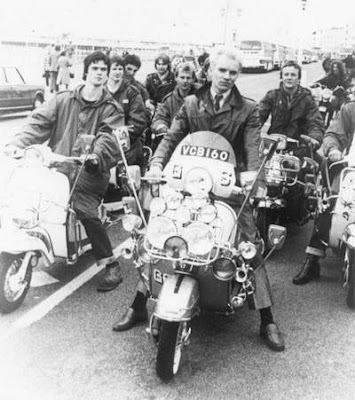 A small number of rockers were isolated on Brighton beach where they – despite being protected by police – were overwhelmed and assaulted by mods. Eventually calm was restored and a judge levied heavy fines, describing those arrested as Sawdust Caesars. So would I have been a mod or a rocker? Neither. Here is the evidence. 1) I hate scooters and mopeds of any form, thus I could not have been a mod. 2) I liked the way the mods dressed better than the way the rockers dressed and thus I would not have been accepted by the rockers either. 3)I like the mods' music choice a little better and I would not have been accepted by the rockers for that reason alone. 4) I was not a part of either of the 2 large youth movements when I was in highschool and college. Having already been faced with the choice to join the crowd, I chose to opt out of both the grunge movement and the heavy metal movement. I like both kinds of music, I just don't all the nonsense that goes along with it.